It was a blast to work with our friends at the Land of Nod to be featured as a "real family"!! We were honored to be included and the photo shoot could not have been more fun. Here's how it turned out! Meet Mary Heffernan and her family, hailing from Los Altos, CA. Is Mary a fan of The Land of Nod? We’ll put it this way: Yep. After seeing Mary’s gorgeous Nod-filled home, is it any wonder why we became such a fan of this family? We’ll put it this way: Nope. Surrounded by tons of Nod décor, bedding and more, we couldn’t help but notice how much this family of six felt at home. Come to think of it, we also kinda felt at home, too. Brian and I would like to thank our friendly followers, loyal customers and our friends who helped us grow our shops and restaurants in Downtown Los Altos. We are very proud of these businesses we created from big ideas and the help of our creative employees. We have sold the businesses and look forward to seeing DTLA continue to prosper. As for the Heffernan family and The H&H Company, we look forward to finding the next adventure in small business. Our newest endeavor is running a cattle ranch in Siskiyou County, Sharps Gulch Ranch, that will focus on sustainable, family-farmed foods. There is a lot of hard work ahead and we look forward to this new journey and implementing our vision. We love new adventures and seeing where they take us! We hope you’ll stay tuned! The H&H Company's owners, Mary and Brian Heffernan, have worked with Rebuilding Together Peninsula for many years- from volunteering at charity events to cleaning out yards. Inspired by the nonprofit's commitment to repairing the homes of our neighbors, H&H sponsored a local rebuilding project on this year's National Rebuilding Day, April 26th. Our volunteer team of chefs, accountants, artists, botanists and many others met early on a Saturday morning to the home of 71 year old Vivian and her three grandchildren. Vivian has lived in her home since 1964. Our skilled construction team, led by Cody Brock, started a few days earlier to make a game plan and begin a few larger projects like installing flooring and replacing cabinetry. So when our volunteer crew arrived, we were able to jump right into the home's revitalization, inside and out! Thanks to the green thumb of Marisa from The Botanist, we tore out overgrown weeds, replanted low water plants like succulents and built a vegetable gardens in the back yard. Whenever possible, we used reclaimed supplies like found bricks for stepping stones and extra wood from Forest on First for the raised beds and a hand-built picnic table. Breaking into teams, some worked on the outside of the home- repainting and replacing the gutter, while others took on the in on the interior- deep cleaning, repairing broken fixtures and repainting bedroom interiors. Vivian's grandchildren, ages 10 and 12, were a great help: cleaning, spackling and painting along with the rest of the team. It was busy day, but one filled with laughter and a community brought together by hard work. We are so inspired by the volunteers all around the US who helped out on National Rebuilding Day. Thank you for rebuilding with us! We are so excited to announce our newest adventure here at The H&H Company: Sharps Gulch Ranch! Check out our new site, sharpsgulchranch.com, and the blog post below to explore the beginnings of our family farm. Things have been pretty busy here at Sharps Gulch: we've been sowing seeds, building fences, refurbishing an old bunkhouse and starting our ranch from the soil up. We purchased Sharps Gulch Ranch in 2013 with dreams of starting a family farm with sustainable products. We have always been passionate about serving the best local products: from local produce to handcrafted items. But now, we are so excited to play an active role in the food we produce and run a full-circle business that allows us to tell the story behind our products. Land of Nod Tour Bus in Los Altos! 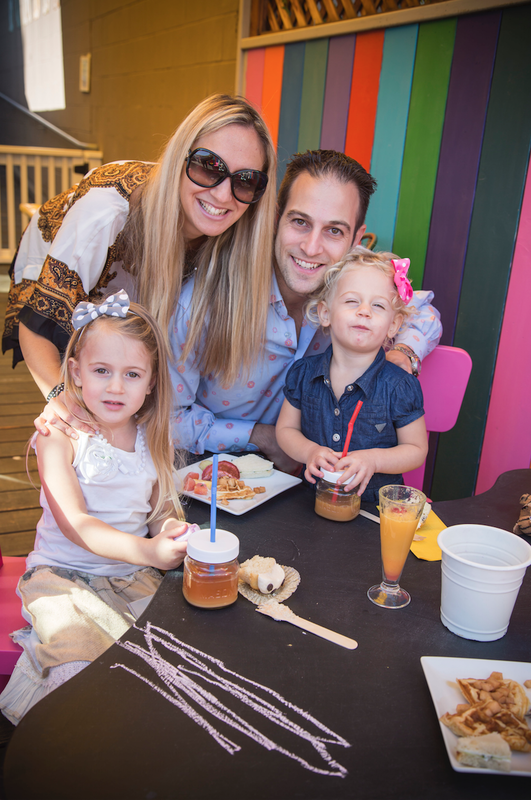 On a sunny, spring day last week, we teamed up with our friends at Land of Nod and Smitten Ice Cream to throw a little party in the Area 151 parking lot! Nod rolled up in a blue-raspberry colored tour bus, complete with play teepees, plush campfires, lots of fun giveaways and a photobooth! With the help of The Makery's DIY skills and Smitten's magical ice cream churning, kids and adults alike worked on colorful disguises with a frozen treat in hand. Thanks to everyone who came out and shared a sunny afternoon with us! If you posed for the photobooth, check out Land of Nod's gallery HERE to find your photo! Every day at Camp H&H is a new adventure as kids make friends, play, create and learn at different spots around Los Altos. Starting with a science-based lesson on geology, geography, astronomy, chemistry and physics in our Play! courtyard, our campers then head over to Red Racer Hobby Shop to race slot cars and engineer LEGO structures. Across the courtyard at The Makery, we have daily craft projects that inspire creativity in little artists. Campers break for a healthy lunch from local restaurants and finish off the day at Area 151 for free time, fun and arcade games with their buddies. And if you can’t pull them away from the all merriment, extended hours run from 2-4pm for $25/hour per child. SIGN UP by the day or for an entire fun-packed week! Forest on First Grand Opening Event! We're beyond excited to open our new play cafe and juice bar, Forest on First, in Los Altos on February 12! We would love for you to join us for our grand opening event. We'll be doing face painting for the little ones, raffling off prizes and sampling menu items. We can't wait for you to see the space! Six Week Workshop Series Coming to DTLA! Camp H&H 2014 Is Coming to Los Altos! Ski week this year is Feb 17 through Feb 21. What a perfect time to hold H&H Camp for the youngsters grades 2nd through 5th to keep them busy and learn new skills during break! At Camp H&H kids will not only be having fun and meeting new friends, but we hope to turn up the creativity a bit and dive into their imaginations. We've partnered up with Area 151, Play!, The Makery and Red Racer to keep the kids entertained and excited each day of the week. Each day will start off in our courtyard where kids will learn a science based lesson on geology, geography, astronomy, chemistry and physics, which will then be followed by a craft project that relates to that day's lesson. Then the campers are off to Red Racer Hobby Shop where they'll get to let loose a bit and race cars on our custom-built slot car track or build LEGO structures. After they get done racing their little hearts out they'll move over to The Makery where they'll work on a series of craft and art projects to induce creativity. In the afternoon the kids will break for a healthy lunch from local restaurants and then finish the day off at Area 151 playing arcade games and bonding with friends over air hockey, dynamic boxing, Doodle Jump, NBA Hoops, plus many others. Every day of the week will be different and exciting and we know they're going to have a great time! A Look Back to 2013 and Exciting Happenings in 2014! Wow we have so much to look forward to at the H&H Company in 2014 with two new restaurants opening this year! But before we dive into that let’s do a quick recap of the craziness that went down in 2013. We opened The Makery in June and have held some awesome workshops these past few months such as Calligraphy, Screen Printing, Knitting and Sewing. They've also hosted really fun events like Sip, Shop & Make where friends joined us at The Makery for a night of libations, discounted shopping and crafting. Since The Botanist opened in July it’s been flourishing with new potted plants, succulents, arrangements and vintage gifts. Our Botanist, Marisa Lyssand, has been arranging and styling different types of flowers for her customers and is doing an amazing job adding her special touch to make each arrangement unique. We opened Red Racer Hobby Shop in June and since then it’s become a mecca for custom slot cars and racing them on the track. They’ve added great new products such as Hexbug, eitech and Gibbon and have been working hard to keep inventory new and exciting. Bumble, Area 151 and PLAY all had a very strong year. At Bumble Chef Brian West revamped the menu and added new savory dishes like the Huevos Rancheros and French Omelette. He also added a new cocktail menu that includes morning must drinks like a Bloody Mary for those day drinkers as well as a Margarita and Old Fashion for those looking for a nightcap. Play and Area 151 have been keeping busy with special events and birthday parties almost every week! PLAY had some great new performers this year like Mr. Palindrome and his silly songs which was a huge hit with the kids. Now onto 2014! We are ecstatic about what the future holds for our current businesses and even more ecstatic about opening new ones. We’re constantly working to keep our products, menu, classes and workshops exciting to fulfill our guests needs and wants. At The Botanist we acquired a fancy new van and will now be making deliveries! 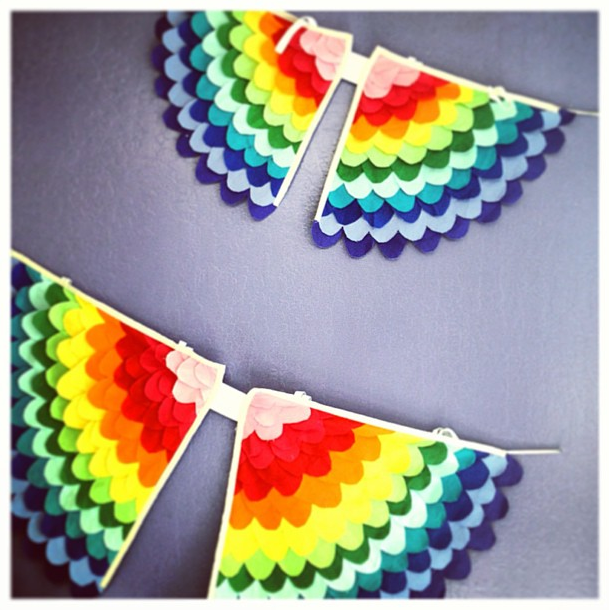 The Makery will be doing a Tuesday Night ‘Craft Club’ from 6-8pm where a new craft will be introduced every week. There will be complimentary champagne and 15% off all retail. Drop ins welcome or sign up for a whole series. We'll also be doing ‘Courtyard Series’ classes put on by Play, The Makery and Red Racer starting at the end of January. There will be Yoga classes, race car building, crafting, plus many others, happening in the courtyard. More details on that coming soon! It’s hard to miss the construction going down on First Street these days. Our newest edition to The H&H Company in 2014 will be Forest on First! We’ll be opening our doors at the end of January and cannot wait for you to step inside our new cafe. Once inside you’ll be transformed into a beautiful woodland space inclusive of a custom-made ‘Treehouse’ play structure for the kids. The Treehouse was designed and built by Barbara Butler and her team using hand-crafted redwood and eucalyptus. The kids are going to love it! In the Forest kitchen they’ll be serving up an exciting and innovative menu pioneered by our Executive Chef, Tyler Morrish whose vision for Forest includes a twist on cafe classics by incorporating California flavor and using locally sourced produce. The menu will consist of items such as quiches, fresh-baked coffee cakes and scones, salads and sandwiches and pressing fresh juices daily. We think you’ll be pleasantly surprised by the menu and will fall in love with the ease of our take-home dinners that will be prepped daily. Keep checking back on the Forest website for an official opening date. So, as you can see we’ve had a very busy 2013, but are extremely excited about what’s to come in 2014. We want to thank you for being our loyal guests. We appreciate you supporting local small businesses such as ourselves and hope to see you in the neighborhood soon. Take care and Happy 2014! 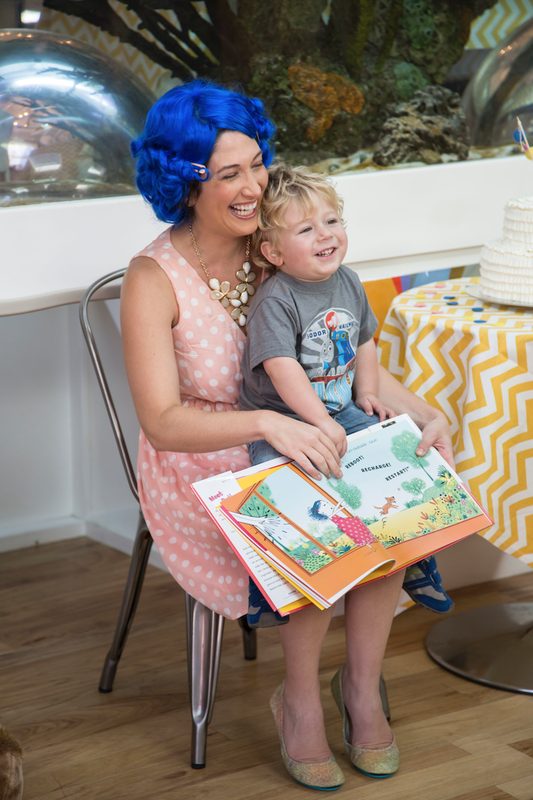 A few weeks back, we were so happy to host a book launch party for Randi Zuckerberg’s new children’s book, Dot! Zuckerberg is the former Marketing Director at Facebook and current founder & CEO of Zuckerberg Media. Recently, she launched two books; Dot Complicated is a memoir and how-to guide on using technology in the modern era, while Dot is an illustrated children’s book about a spunky, tech-obsessed little girl named Dot who learns to unplug and play outside. 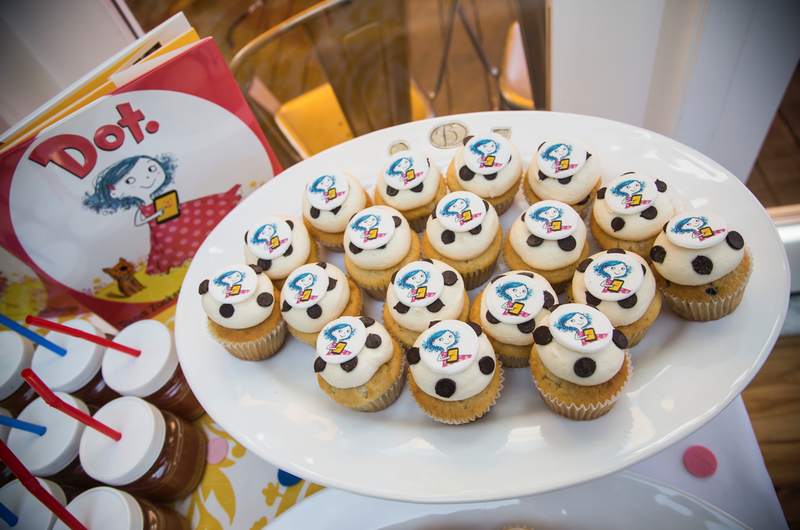 Since the party was for the children’s book, guests were encouraged to bring their kids, who could run around in the playroom while adults mingled. A breakfast buffet included sausage sliders, “pinkalicious” pancakes, and cucumber sandwiches. Adults sipped on flavored mimosas, while kids munched on waffle triangles. Kara’s Cupcakes provided “Dot” chocolate-chip cupcakes for the event, and The Makery provided colorful decorations. Midway through the event, Randi read her book out loud to the kids in attendance (with some help from her two-year-old son, Asher). All guests went home with full bellies and a signed copy of Dot. Chef Brian West started cooking at a young age and quickly learned that his future was in the kitchen. After high school, Brian attended the California Culinary Academy, in San Francisco. At 18 years old, Brian graduated from The CCA and dove straight into his career. He has cooked in some of the best restaurants in California, spending most of his time in San Francisco, San Diego, and Napa Valley. In 2012, Brian took his talents to Sebastapool in the Sonoma wine country to be the chef of Risibisi. Brian continued to forge this relationship with the local farming community, purchasing almost entirely from farm direct sources. Chef Brian also held dinners in which a specific farmer could be highlighted. Utilizing these amazing products, Chef Brian was able to put his own stamp on Italian cuisine in the California wine country. In the late summer of 2013, Chef Brian was recruited by Mary and Brian to take over the stoves at their cornerstone restaurant, Bumble. He found that they all shared a love for locally sourced and sustainably raised ingredients and products. The passion and love for the farmers, ranchers, and fishermen that Chef Brian had developed early on is fully realized at Bumble. He embraces the chance to cook high end food in casual environment for parents and their children alike. "Everyday we try to develop stronger relationships with local producers to provide the highest quality dining experience for the customers of Bumble." Halloween at Play and in DTLA! A few days before Halloween, our old friend Teacher Jo stopped by for a "crafter noon" full of spooky Day of The Dead Art. There was sugar skull decorating, skeleton collages and more that kids and even some adults had fun creating some spooky crafts. On actual Halloween, The H&H Company hosted a booth for the city's annual "Halloween Spooktacular!" We had a great time seeing lots of familiar faces and some amazing costumes. We hosted a carnival classic, The Fish Toss and it was a complete hit! We were busy all afternoon with kids of all ages trying their luck at winning a goldfish to take home. We hope everyone had a great Halloween too! Have you heard the news? Starting Tuesday 10/22, Academic Trainers will be here to help students in reaching their academic goals. Academic Trainers offers one-on-one tutoring in ISEE/SAT test prep, as well as homework help for all elementary and middle school subjects. One-on-one tutoring is what Academic Trainers does best! Their experienced tutors will help students to master the fundamentals of any subject by incorporating study skills, organizational skills, and time management into every session. Our tutor will also work alongside students to prepare for private school entrance exams by providing them with a thorough and comprehensive coverage on test materials as well as strategies such as time management in testing environments. We will also provide students with an overview of fundamental math concepts, verbal review, and critical thinking skills for questions commonly found on tests. We also encourage students to stop by for extra test prep if they really need it. We also offer classes like the ones found at AT. On a Tuesday evening late last month we kept our doors open late for a night of crafting, shopping & champagne. Our first Sip, Shop & Make event was such a huge success and we were so happy to see everyone enjoying themselves, learning how to make new crafts and making friends! The Makery staff had a ton of fun hosting this event and we learned a lot! The night was full of surprises: we had nearly 75 attendees and we raffled off great prizes. We're having our next Sip, Shop & Make this Tuesday, October 22 with even more surprises in store. Retail will be 10% off with special give-aways, champagne and light bites will be served, and we'll have even more room for making. Invite your friends for a night of fun at The Makery! We were so excited for the return of our friend Teacher Steve! 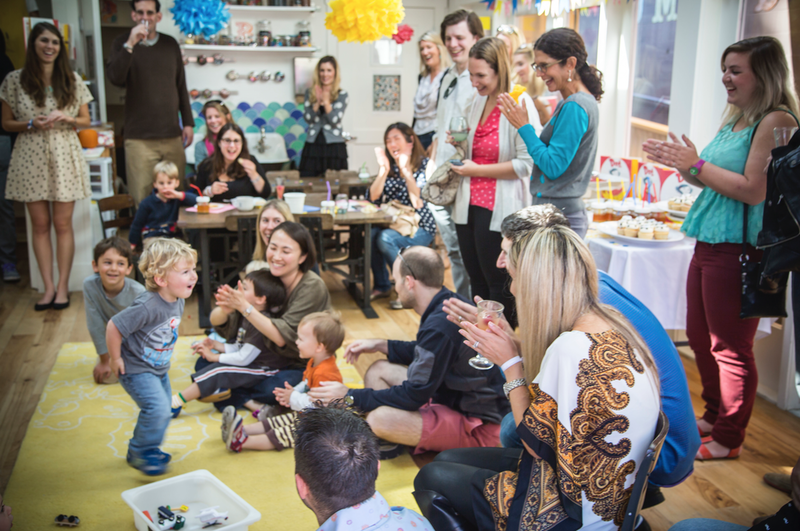 This will be Steve's 2nd year with us here at PLAY and we love the way he blends song and story telling in his 45 min class. Steve is also a member of the band Orange Sherbet where he sings and plays different instruments with his wife and sister. You may have seen them on the State Street Green this summer! His Tuesday morning music class was missed this summer and we are excited to have him back with us for the school year. Teacher Steve's first class back was packed with happy kiddos ready to rock out with him. Teacher Steve will be with us every Tuesday at 10am. Come check out his fun for all ages musical jam! Play was so excited to have our old friend Andy Z visit Play last Friday, his first time since our big makeover! He came for a little afternoon jam session and played some old favorites as well as some new songs. Everyone had a blast rocking out with Andy Z! Don't miss next months special event with Fur, Tails, and Scales on Friday Oct 18th at 4pm! A little bit of luck just rolled through our doors at The Botanist! The Marimo Ball, also known as a Japanese moss ball, is just about the neatest thing we have seen. They are the lakes version of a pet rock. These “balls of seaweed”, which is a direct translation of "Marimo", are a special type of algae growing in lakes around the world. Domestic Marimo grow in tap water at room temperature as long as the water is changed every one or two weeks (more frequently in summer and less often in winter). The Marimo can be placed in the refrigerator in hot weather (above 25°C), but does not survive freezing. 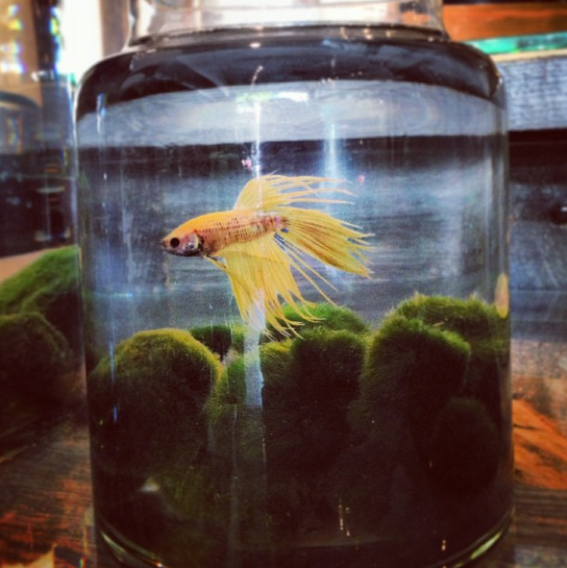 The Marimo Ball is created by the gentle movements of the water giving it a velvet texture. Japan considers these little guys a National Treasure, even celebrating them annually since 1950 at the Marimo Festival! They can live up to 200 years growing just 5mm each year. Take excellent care of your Marimo moss ball and it is known that all your wishes will come true. 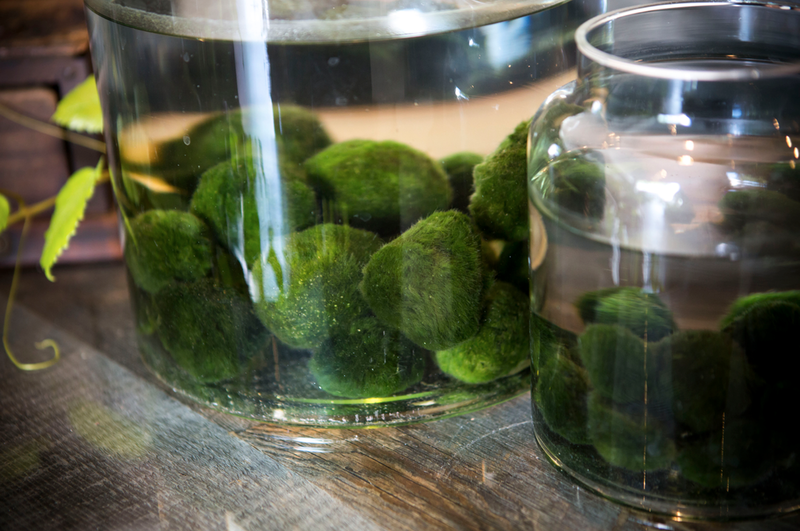 Marimo Balls are passed down as family heirlooms, after all they do represent everlasting love! September is shaping up to be a fun filled month for us! Our friend Andy Z will be stoping by on September 13th at 3pm for a fun filled afternoon concert full of some Andy favorites! To get ready for his arrival we will be hosting Andy Z themed crafts in the classroom all week leading up to Friday's performance. 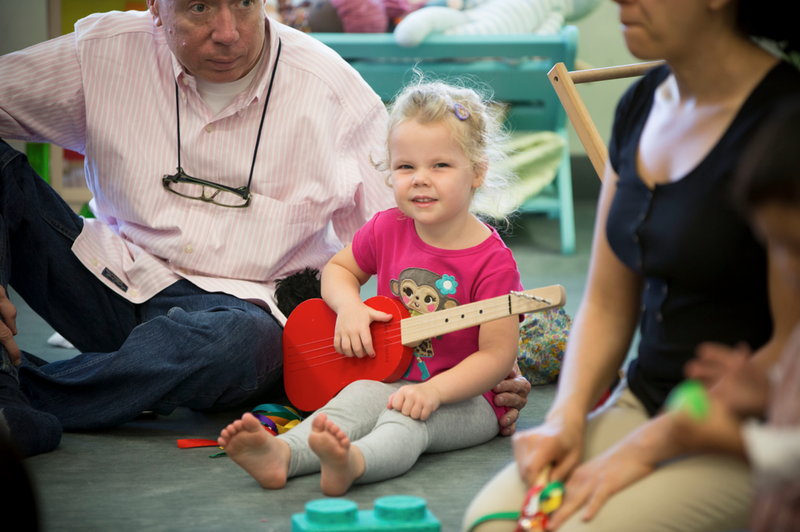 We know that many of you have been anxiously anticipating the return of Teacher Steve's Tuesday morning music class and we are happy to announce that Steve will be back on Tuesday September 17th at 10am through the end of the school year! Dance with Karen, Spanish Music Teacher Andrea and S.P.Y. Yoga will also all be continuing at Play this fall! We've got 2 brand new games at Area 151 and they're awesome! The first game is a brand new racing game from Sega called GRID: Race Leader. Players race in four exclusive tracks and take control of over 16 licensed cars as you go head-to-head to take control of the leader board. Go solo or compete against a friend in Versus Mode to see who will come out on top. Our second game is one you may already be familiar with. 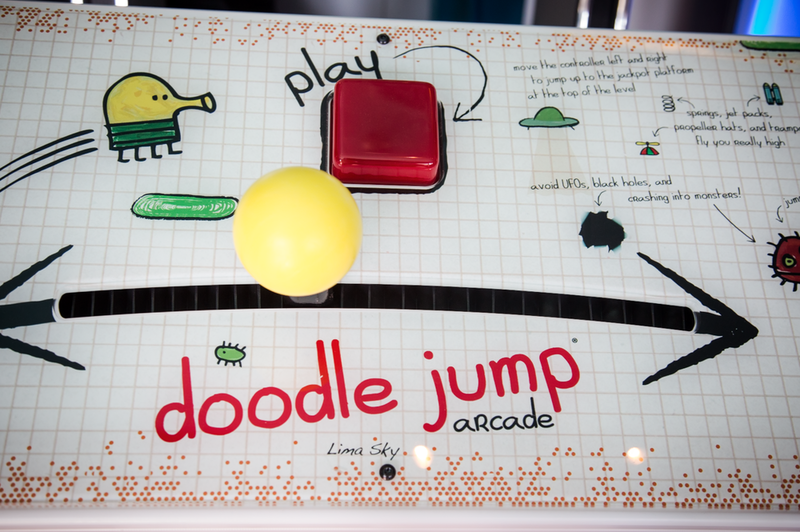 Introducing: Doodle Jump! The game we all know and love on iPads and iPhones is now ready to play at the arcade. Just as addicting and as easy to play but now with the added bonus of tickets! Come on down and play a few rounds today!